They lurk in the wild places where people fear to tread. They stalk the cities and prey upon the unsuspecting human masses. Man-beasts, shapechangers, werewolves. The name doesnt matter. Theyre abominations, a part of and a violation of both man and nature. Thats why hunters set out to prove whos the real king of the beasts, once and for all. 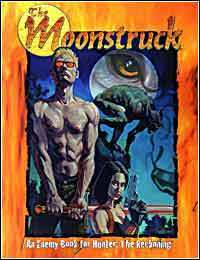 Hunter: The Moonstruck explores the savage realm of shapechangers as hunters perceive it, learning man-beasts strengths, fears and weaknesses. The predators may seek to cull the human herd, but now they discover that the flock has grown teeth of its own. The hunters become the hunted.